We all know very well that WhatsApp is undoubtedly one of the best and most used private messaging tools out there. With constant news, has managed to remain at the top of the choice of users. 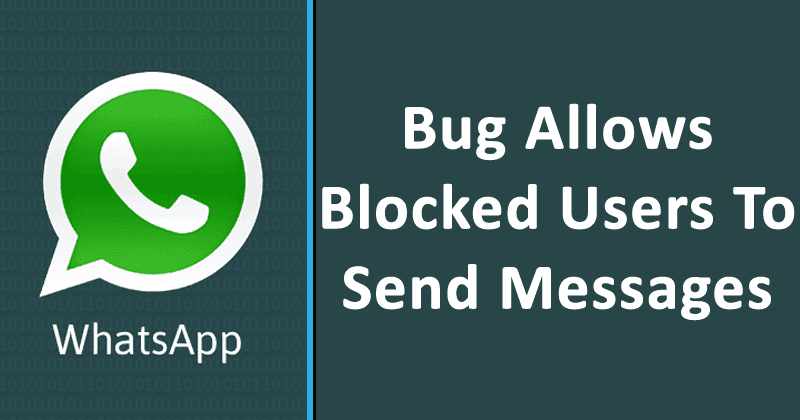 However, now according to the latest reports, recently, a WhatsApp bug has been discovered that simply allows blocked contacts to send messages. WhatsApp is undoubtedly one of the best and most used private messaging tools out there. With constant news, has managed to remain at the top of the choice of users. Like any other service it also has flaws and problems, always resolved quickly. The most recent problem came a few days ago, with the possibility of receiving messages from contacts that are blocked. The ability to block contacts is present in most messaging software and allows you to stop receiving messages from people you do not want to interact with. It’s essential, and WhatsApp has worked well. The failure that has been reported in the last few days realizes that this blocking feature has stopped working and the blocked contacts have once again been able to view the status of the user and send messages to them. The reason for this problem is not known for sure and it is not affecting all users in a global way. From what it was already possible to test, the simplest way to resolve, even temporarily, this problem is to remove it from the lock to the contact and add it back to the block list. WhatsApp has already recognized this problem and the dev team already now preparing a new version of its app to address this issue and resolve it fully. The new version should be available at any time and distributed to users. This is a serious problem but one that is suspected to be on the side of WhatsApp servers. Despite having a “manual” solution, it requires a direct intervention from WhatsApp itself to be resolved immediately.